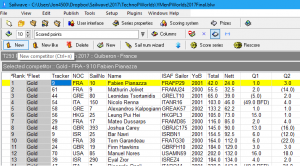 Sailwave is a popular, fully featured, easy-to-use, multi-lingual, sailing results/scoring application for Windows – running on other platforms via Windows emulation software. Sailwave was created by Colin Jenkins in 2001, who has been joined by Jon Eskdale in 2012. Sailwave is supplied free of charge. Some users have kindly made a voluntary donation in return. In 2012 Colin was given an award for contributions to sailing by the Welsh Yachting Association and in 2013 a National Award presented by HRH Princess Royal from the Royal Yachting Association. Flexible publishing tools allow results to be targeted to web browsers, blogs, websites, email and sailing news sites like Yachts and Yachting. In the UK you can also use it to send your handicap returns to the Royal Yachting Association instead of work it out on paper. In addition to the help available on this website, friendly help and advice from hundreds of experienced Sailwave users and the authors are available from the Sailwave User Group. Please use the group for all communication so that the most appropriate person can respond. Although primarily used at sailing events and regattas, Sailwave is also used for many other water sports including windsurfing, kite-surfing, ice yachting, land yachts, model boats, archery and even in virtual world sailing regattas. Runs natively on all versions of Windows. Runs on Linux/Mac under Wine HQ or Parallels Desktop. No native Sailwave install is available. No extra programs or licenses are required such as Excel. Completely self-contained. RYA returns facility. Send elapsed times to the RYA over the internet. No need to do an annual return! Upload load your results to the Sail wave results folder. Send results to ISAF using their XML regatta specification. Sailwave is supported via the Sailwave User Group (SUG). World Sailing RRS 2017-2020 Appendix A compliant. Support for languages other than English via locale files, which users can create for themselves or download from this web site. Fast results entry via the Sail Number Wizard. Elapsed time, start/finish time, place and retirement code finishes all supported. Send your news (reports, results, and photos) directly to the to Yachts and Yachting magazine website. Appendix LE Addendum C capability. Flights can be scored with multiple 1sts, 2nds etc., even if they have been recorded with elapsed times or start/finish times. A series can be set up with qualifying and finals races. ISAF Submission 025 Olympic format medal race capability. Publish to web documents (HTML) for upload to web sites or printing or emailing. Publish to email attachments if you have a MAPI compliant email client. Publish directly into programs like Microsoft Word and Excel etc. Publish a series summary and/or individual race details (elapsed, corrected etc). Publish retirement sheets, competitor lists, alternative penalty sheets etc. Import race data collected by timing devices via a CSV file. User definable templates (HTML) and styles (CSS). User definable rating systems via flexible expressions. Performance feedback in results based on elapsed times. Initial rating systems include: RYA PY & NHC, USSA PN, ISAF SCHRS, Texel, PHRF (TOD & TOT), CHS, IR2000 (IRC & IRM), ECHO, Victorian, General TCF, RORC. User definable low and high point scoring systems via flexible expressions. Initial low and high point systems include ISAF Low Point, Bonus Point, Rinderle B, Austrian. One-design, handicap and average lap racing. Flexible scoring: score across all competitors or by fleet, club, nationality etc. Wind indexed rating values available across all rating systems. Support for the RYA National Cruiser Handicap scheme. Further details available here.